I've said before that I'm not very good at baking, and while that's okay I still find myself feeling a little guilty when I can't bake a magnificent cake for my boys. What I can do though is follow instructions, I'm great at that, so instead of baking a cake I decided to try out the Jus-rol Cinnamon Rolls and Pains aux Raisins. Jus-rol makes it easy for people like me with their easy to use 'Bake it Fresh' products. My boys loves Cinnamon Rolls, whenever they are on the menu they scream with enthusiasm and can't wait to try them. 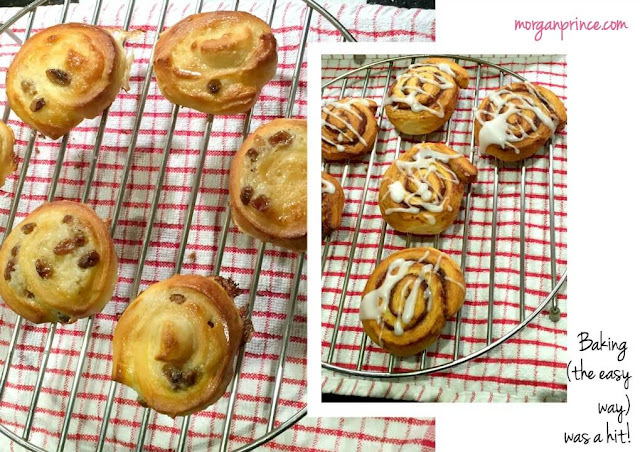 For a treat I (okay, the Hubby) decided to get some 'Bake-it-Fresh' Cinnamon Rolls and Pains aux Raisins to try. What I loved about these products is they're super easy to use. Opening the tube is simple, the instructions are great and the end product is brilliant. When I opened the Cinnamon Rolls tube I was surprised at how soft the dough was, my first thought was "how am I going to cut this?" but I have some fantastic sharp knives so cutting it up wasn't a problem. I chopped the dough into six and placed them on a baking sheet. Next I opened up the Pains aux Raisins, this one was a little more difficult... well perhaps difficult isn't the word. Cutting it was just as easy as with the Cinnamon Rolls but the vanilla filling was squashed out of the sides each time I cut into the dough. It was quite messy. After I'd cut up the Pains aux Raisins in the same way and placed them on the baking sheet I brushed them with milk. With the oven pre-heated I put the baking sheet into the oven. The Cinnamon Rolls took 12 minutes to cook, the Pains aux Raisins took 10. Once they were ready I put them on a wire tray to cool and sorted out the icing. Each box came with a small tub of icing sugar and instructions on how to mix it. With the Cinnamon Rolls I had to add 1 1/2 teaspoons of water, this made the icing almost runny but not quite. Once it was ready and the rolls were cool I drizzled (or plopped) the icing onto the rolls. The Pains aux Raisins were slightly different, the icing instructions asked for 4 teaspoons of water instead of 1 1/2, which made the icing a lot more runny. Luckily though there's no drizzling required because this icing sugar is just meant for the glaze on top of the Pains aux Raisins. I used a brush to paint the icing onto the Pains aux Raisins. After a few minutes the icing had set and I handed the treats out to my boys. Within minutes they'd finished them off and were asking for more. Definitely a hit! I enjoyed using the jus-rol products, even though the Pains aux Raisins ended up being a little more messy than I thought it would the end product was really tasty. 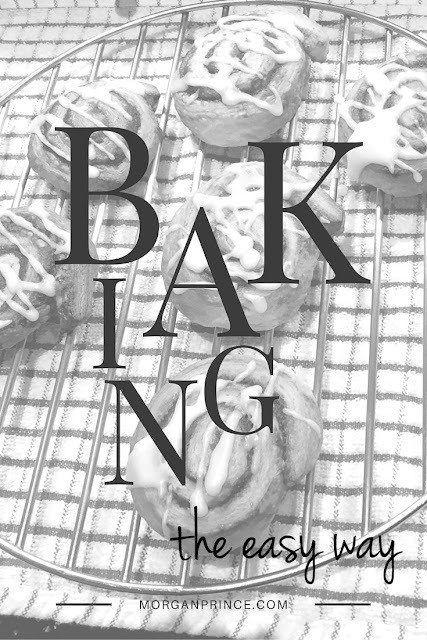 For any novice baker or someone who can't bake cakes (like me!) then I'd definitely recommend these. I bought the product and wrote this review, I was not asked to do so by the company. Ohh! I think I am going to have to try these. They look very tasty! Thanks Kim, they're really tasty and so easy! Ah cinnamon rolls are my weakness. I'd have to eat them warm straight out of the oven. Next time I need a treat I'm definitely going to get some of these!